Between 1909 and 1931, the City & County of Denver issued several publications to inform the public and promote the city. 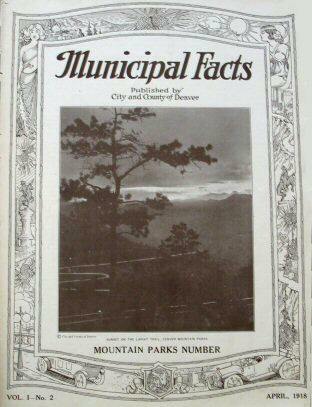 These magazines provide a wealth of material on the history of the Mountain Park system and other municipal efforts. Copies of Municipal Facts and The City of Denver are available in the Western History Collection at the Denver Public Library and are also available online. The first issue appeared February 20, 1909, and numbers were issued weekly through September 28, 1912. Most issues were 16 pages. In 1912, Municipal Facts came under fire for the "boosterism" and alleged political bias of its editorial direction. In Vol. 4, No. 37, issue of September 14th, 1912, it was announced that the magazine would be "abolished" as of September 28th. Publication ceased with Vol. 4, No. 38. In all, about 180 issues were published. 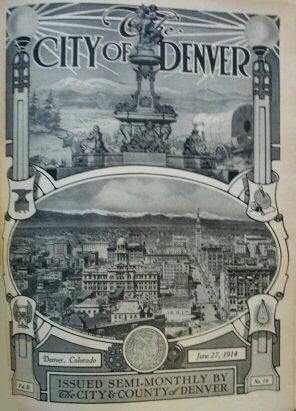 A semi-monthly publication, the City of Denver was launched with Vol.1 No.1 on October 1912. Following immediately on the previous journal, it was promised to be "non-partisan and non-sectarian." Twenty-four issues were published in each of 1913 and 1914; most were 16 pages. This magazine ceased publication during the years of World War 1, with the final issue Vol. III No. 6 published December 31, 1914. In all, 54 issues were published. 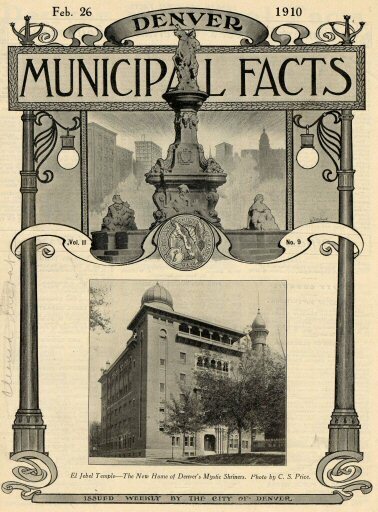 Beginning in 1918, Municipal Facts was revived as a monthly or bimonthly publication. Volume numbering restarts with Vol. 1, No. 1 in March 1918. With the issue of June 1919, the name was officially changed to Municipal Facts Monthly to distinguish it from its predecessor. As it became a bimonthly about 1922, the “Monthly” was dropped from the cover page. This edition apparently ceased publication with Vol. XIV, No. 5 & 6, May-June 1931, without explanation. In 1934, articles from Municipal Facts related to the Mountain Parks system were compiled and typed as a part of C.W.A. Project #107, under the direction of Ben Draper, City Clerk. This project mostly covered issues from 1918-1928, but a few from earlier years were included. Some of the documents provided on this website are from that manuscript version, but wherever possible we are replacing them with the Municipal Facts articles as originally published.